After 5 eventful days in Bangkok, seeing the sights, & gorging ourselves on delicious street food… we were keen to move on & see more of Thailand. We learned of Kanchanaburi while sharing travel stories with fellow travellers over breakfast in our Guest House. Considering it’s proximity to Bangkok, and that we had only a few nights to kill before we were due to meet friends on Thailand’s islands… Kanchanaburi seemed like the perfect place to getaway from the madness of Bangkok for a few days and see a bit of the Thai countryside. 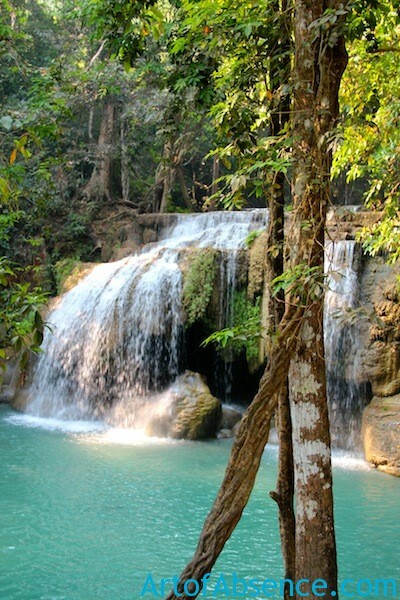 Kanchanaburi, which sits around 110kms NW of Bangkok – is home to the infamous Bridge Over The River Kwai made famous by the hollywood film of the same name. We stepped off the bus mid-afternoon after a relatively short bus ride from Bangkok & were predictably met by the usual gathering of taxi & tuk tuk drivers, all competing loudly for business. After negotiating what we felt was fair price with one of the drivers, we followed the driver into the carpark & got a bit of a surprise when… instead of spying a typical taxi (4 wheels & an engine) the man proudly gestured over to his “ozone friendly” 3 wheeled, peddle powered tourist transit machine. There were two of us. Plus all our gear. So my immediate reaction was to tell this guy we would have to find ‘real car’ as we couldn’t fit ourselves + all our gear on his small machine. Anyway, a few minutes later after hearing some very compelling reasons why this was the best transit option for us… we were off down the street at a respectable pace of approx 8kms per hour, in the direction of Kanchanaburi’s main tourist road. After dumping our gear in our room & a quick freshen up, we hit the main street for an evening stroll in our new destination just in time to catch the sun go down. And slowly made our way to the local night markets (where I highly recommend the fresh mango smoothies). As the attractions surrounding Kanchanaburi are spread far & wide… we opted to make life easy on ourselves & book in a day tour. Part of ‘the death railway’ and constructed in WW2 by POWS… unlike the bridge depicted in the film the bridge that stands today is steel. A frequent target of allied bombing raids during the war it was rebuilt & only a portion of the bridge is original. The waterfalls (which are worth getting out of bed early for – if you want to avoid being met by a car park full of 50 seater tourist bus’s) are around a 45 min drive from town. Boasting 7 pristine waterfalls in total… its around a 2km hike up a dirt goat track for those keen to take a dip at the very top. As we slowly closed the gap between us & the highest waterfall, every so often the noise of a falling leaf or twig tumbling through the dense forest above would draw our eyes upwards, into the forest canopy… where a group of monkeys were playfully making their way own way through the forest. The constant flow of water has formed natural pools underneath each of the waterfalls that tourists are encouraged to use as swimming holes. After a significant amount of exertion – upon reaching the highest waterfall… slipping into the natural pool to cool off was to tempting an opportunity to pass up. Standing directly underneath the waterfall gives an insight into the power of water – the force of the cascading water drowns out all other sounds of the forest while providing some much needed revitalisation after the trek to the top. The swimming holes are teeming with fish… who incredibly are not at all weary of the presence of tourists & are only too happy – if you sit still in the pools long enough… to gently nibble at your toes… cleaning the dead skin away from your body. 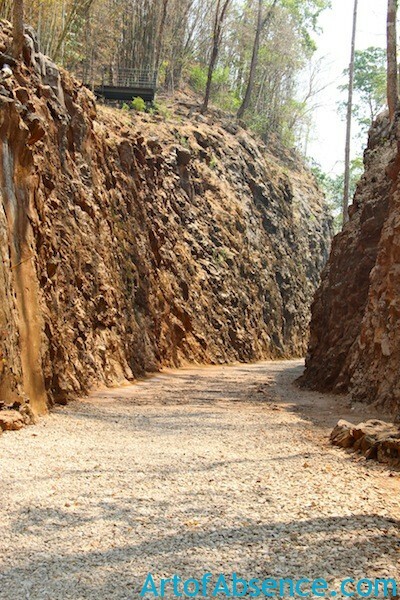 Our next stop – an Australian Government funded museum located at the sight of one of the most torturous sections of the Thai – Burma railway known as Hellfire Pass offers an insight into what conditions were like for those forced to slave day & night on the railway in order to keep the Japanese war effort on track. Hellfire Pass is a 110 metre long, 17 metre deep canyon carved through solid rock by Australian, British & Dutch POWs during WW2. It’s a sobering experience hearing the POWs recount their stories of mistreatment and brutality at the hands of the Japanese. Made even heavier when you visit Kanchanaburi’s War Cemetery where almost 7000 mostly Aussie, British & Dutch POWs are laid to rest. Kanchanaburi’s War Cemetery in the towns centre is the final resting place for 6,982 former POWs killed during World War 2. 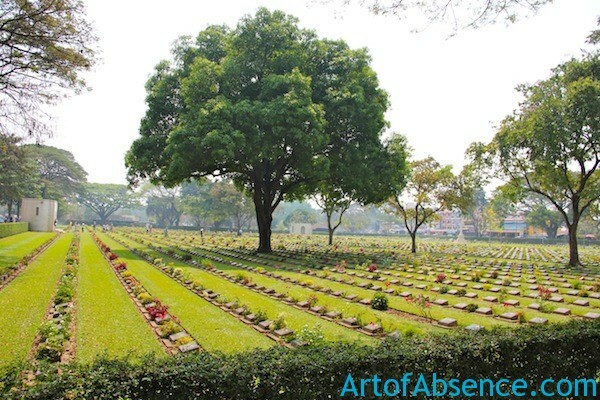 The cemetery is one of two in Kanchanaburi immaculately maintained by the Commonwealth War Graves Commission. As we quietly wondered through the cemetery paying our respects… I couldn’t help but feel a surge of patriotism when passing by small Australian flags that family members & friends had planted in the ground next their loved ones. 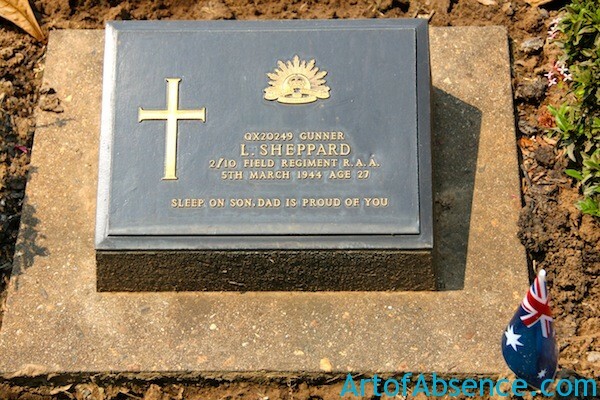 What Happened To The Thai to Burma Railway After The War? When the Allies kicked the Japanese out of Thailand for good, the British gained control of the railway which was eventually sold to the Thai Government. Part of the track operates to this day and our tour included a brief train ride through the countryside surrounding Kanchanaburi. We encountered some confusion as our guide tried to inform our small group which station we should disembark if we should get separated from her at anytime throughout the trip. And as the train ground to a halt at the third stop and passengers started to clamber off onto the dirt platform, we suddenly became aware that we weren’t sure which station we were meant to be getting off at. This station? or the next one? Most passengers seemed to be disembarking here… so by simple power of deduction, there’s a fairly high probability that this was our stop. 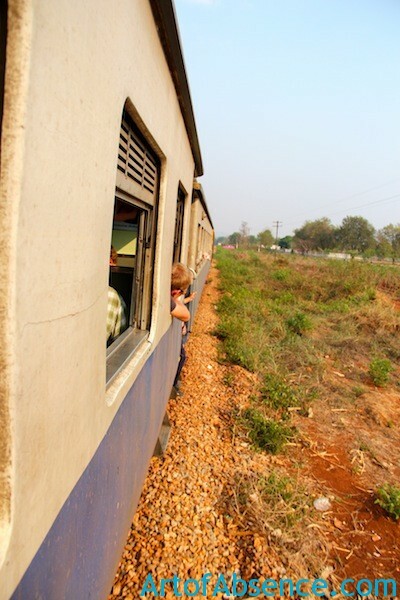 We clambered off the old train… eyes scanning over other passengers, trying to find a familiar face from our tour group. And just as the train started to chug away from the station, we heard a familiar voice calling our names through the crowd. It was our tour guide… who was still on the train! Maaarc, Annaaa… the next stop… not this one…. 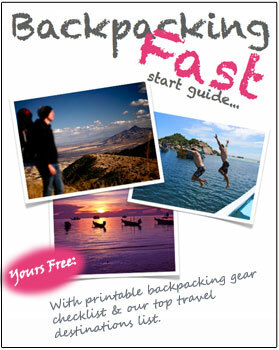 the next stop! The train was gathering speed at his point but we made a judgement call & both bolted for the closest door, grabbed the handrail & pulled ourselves back onto the moving train. Personally, feeling a small sense of accomplishment from boarding a moving train and dispelling the myth that jumping onto moving trains is restricted only to Mumbai locals & hollywood actors! If you like to stay in shape when oversees… running is not a recommended practice in Kanchanaburi. On our first morning, just after sunrise we set off jogging at a moderate pace down the main road we had strolled along the previous night. Defensive. Evasive. Or my personal favourite… curl up in the foetal position on the ground and pray they leave us alone. Hoping the dogs would get bored proved futile as they continued to plow down the road barking menacingly as they closed the gap between us & them. Suddenly from a side street, another angry dog appeared and enthusiastically joined the chase. Then another. And another. It seemed every driveway, alleyway, & side street was harbouring a mangey mutt just waiting for something or someone to stir it into action. To our dismay each new dog filed into rank alongside the next… until they seemlessly formed a pack of raging mongrels all hellbent on getting a piece of European ankle, calf, or thigh. Sensing it was our running causing the dogs to be over-stimulated – our best defence it seemed… was to cease running & hope the dogs would lose interest. As the pack approached, a few of the stragglers seemed to loose interest the moment our running stopped & thankfully, the last two who had instigated the whole show were scattered at the last minute by a few passing scooters. That was the end of our exercise regime in Kanchanaburi. Buses depart every hour from the Southern Bus Terminal in Bangkok. We Stayed at the Blue Star Guesthouse. 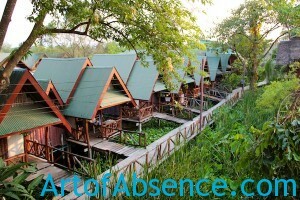 They have premium bungalows that are perched over the river and also offer budget rooms a bit closer the main road. 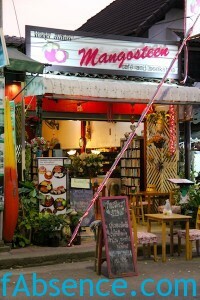 When we stopped at Mangosteen to peruse the menu one afternoon, a customer offered us her glowing opinion on the food so we made sure we went back that night for dinner. Previous post: Bangkok Thailand – Foodies Paradise or Just Another Dirty Capital City?